An introduction to NXP's unique configurable peripheral the State Configurable Timer which can be found on the LPC1800 microcontroller and LPC4300 digital signal controller. 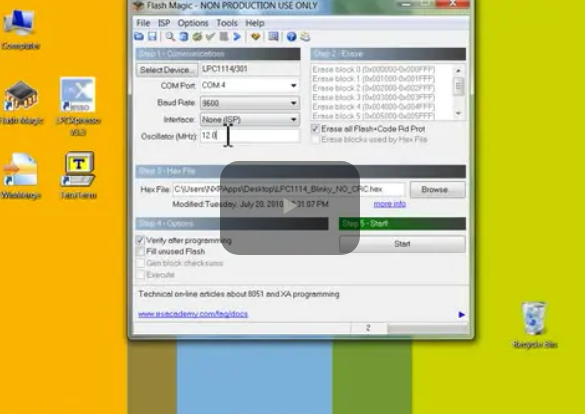 A short introduction to NXP's SPI Flash Interface on the new LPC1800 microcontroller. SPIFI allows the designer to memory map into their system low cost Quad SPI Flash parts providing a simple and inexpensive way to add large amounts of flash. 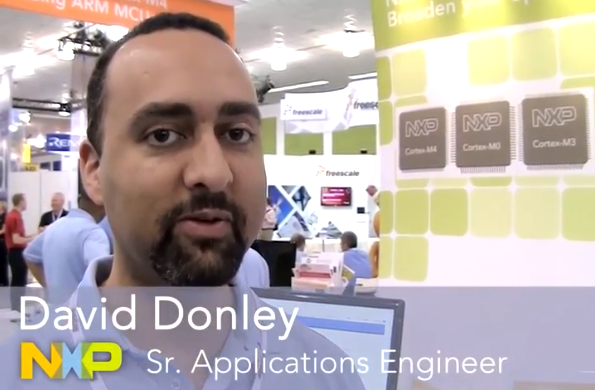 Simplify your motion control designs with NXP's LPC1500 microcontrollers. 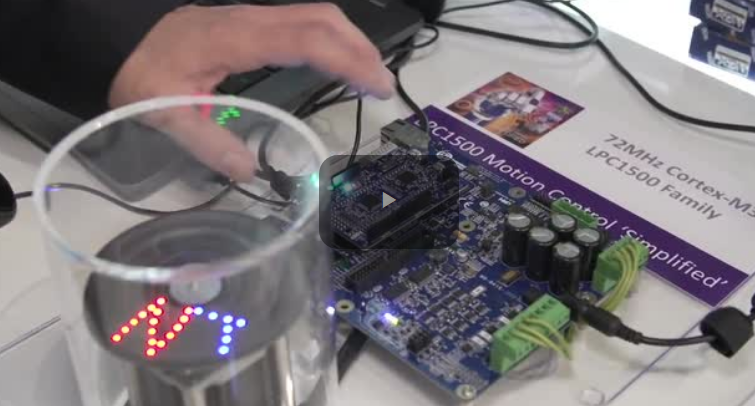 This video is an overview of our solution to aid in the development of motor control applications in a fast, easy, and flexible kit. NXP® LPC1500 enables simultaneous control of two motors with a flexible, efficient design process. Press Release: http://www.nxp.com/news/press-releases/2014/02/new-lpc-microcontroller-streamlines-motor-control.html NXP Semiconductors announced the release of the LPC1500 microcontroller series, optimized for fast, easy, and high-precision motor control. The new microcontrollers incorporate all the features required for high-accuracy sensored and sensorless motor control, enabling simultaneous control of two motors in highly flexible configurations. With ultra-efficient motor control firmware, easy-to-use GUI-based tuning tools, and two new motor control solution kits, NXP LPC1500 microcontrollers simplify evaluation and development of motor control applications, without requiring deep motor control experience. 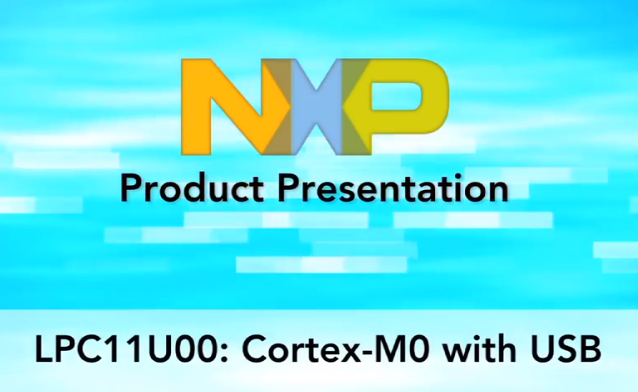 This video is an overview of the new LPC11U600 microcontroller series from NXP®. The enhanced features in the LPC11U6x enables its use in a wider range of applications including consumer, commercial and industrial, wired and wireless routing, handheld medical equipment, PC/gaming accessories, and more. The LPC11U6x extends the memory options of the LPC11Uxx family by doubling flash to 256 KB and tripling SRAM to 36 KB. The LPC11U6x includes a USB device controller certified by the USB-IF. With embedded USB drivers in ROM and on-chip PHY, the LPC11U6x helps to reduce design time and cost as well as application program footprint. 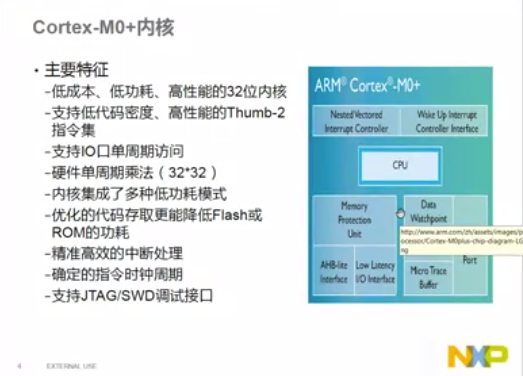 NXP® Semiconductors' Tony Xia provides an overview of the LPC11U00 family of ARM Cortex-M0 microcontrollers with USB -- including detailed look at the LPC11U10, LPC11U20 and LPC11U30 series. 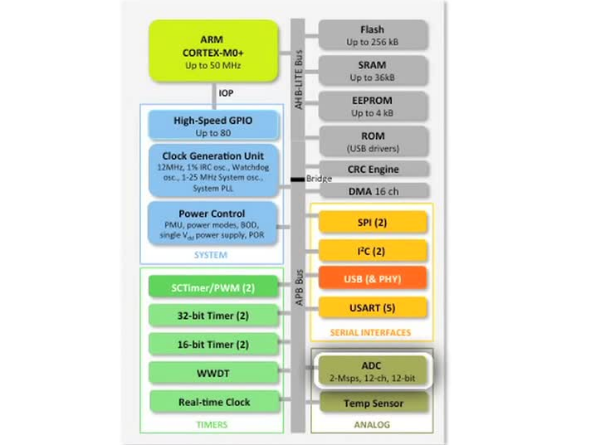 Based on the ARM Cortex-M0 processor, NXP's LPC1100XL family of microcontrollers features the lowest active power consumption in the industry at 110 µA/MHz and reduced deep sleep current below 2 µA. 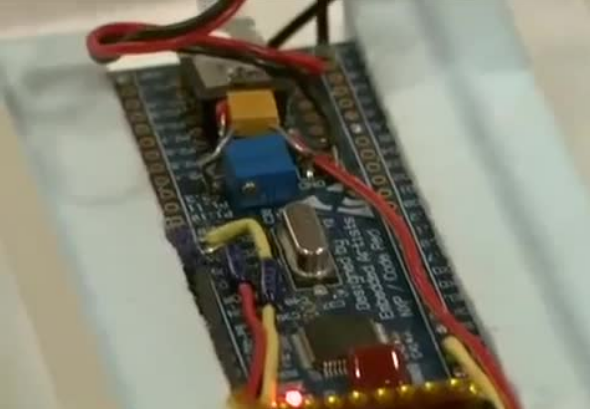 In this demo at Design West 2012, Amit Bhojraj of NXP Semiconductors discusses key features of the LPC1100XL and shows power consumption levels using the PowerScale tool from Hitex. This module provides an introduction to Code Read Protection (CRP). It covers how to enable CRP, as well as the various CRP levels that can be set. It covers some of the potential pitfalls users can encounter (if they are not aware of CRP), and explains how these can be prevented by deliberately controlling the tool chain's linker. Examples are given for IAR, KEIL, and LPCXpresso (prior to version 3.5.6 which includes native support for CRP). This module is largely indpendent of the LPC1000 Debug Tools, Tips, and Tricks (Part 1) training module, although you may wish to view that module first as it covers ISP and Valid User Code. This module covers ISP and Valid User Code for the LPC11xx (Cortex-M0) and LPC13xx (Cortex-M3) part families. While not explicitly discussed, the majority of this material is applicable for LPC17xx (Cortex-M3) devices as well. ISP is supported in several flavors: A low level serial interface, GUI automation of this serial interface via Flash Magic, and on the USB enabled LPC13xx devices as a mass storage device. To supplement the use of ISP, the criteria for validation User Code by the on chip boot loader is discussed, and examples for all major development tools are covered. Following this module, you may wish to view the LPC1000 Debug Tools, Tips, and Tricks (Part 2) which goes into detail about Code Read Protection (CRP). 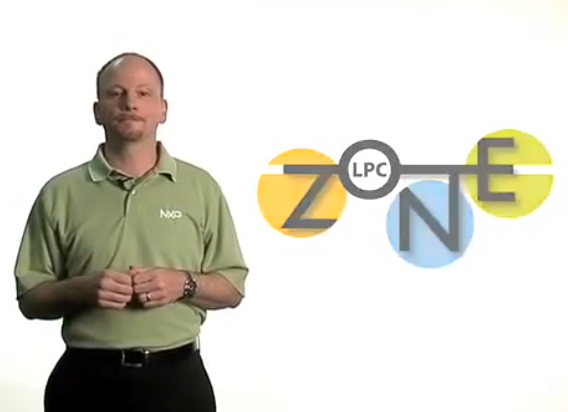 This video describes the LPC-Link 2 in a short how-to-video. At DESIGN West 2013, NXP® is introducing LPC-Link 2 -- the first standalone debug adapter of its kind, which can link a variety of popular IDEs (integrated development environments) to any microcontroller development board. 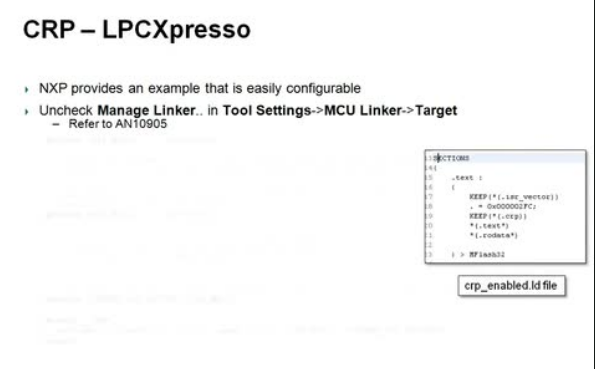 The LPCXpresso-IDE, developed by Code Red Technologies, works out of the box with LPC-Link 2. In addition, several firmware images are available for LPC-Link 2 which make it compatible with other tools, including the popular SEGGER J-Link and the CMSIS-DAP debugger designed by ARM. 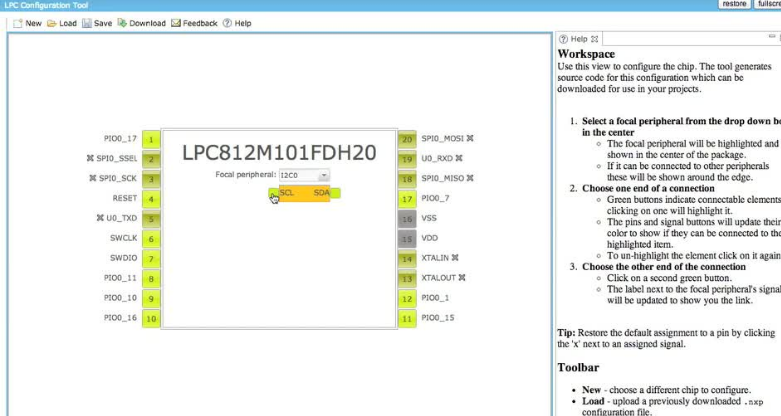 This video give a tutorial on the LPC Initialization tool from NXP® (http://www.lpcware.com/content/tools/lpc-initializer) which allows users to configure the pinmuxing of the LPC800 via the Switch matrix as well configuring the IO CON block with a simple graphical interface. Additionally, the video demonstrates how to use the different aspects of the tool to configure an LPC812. 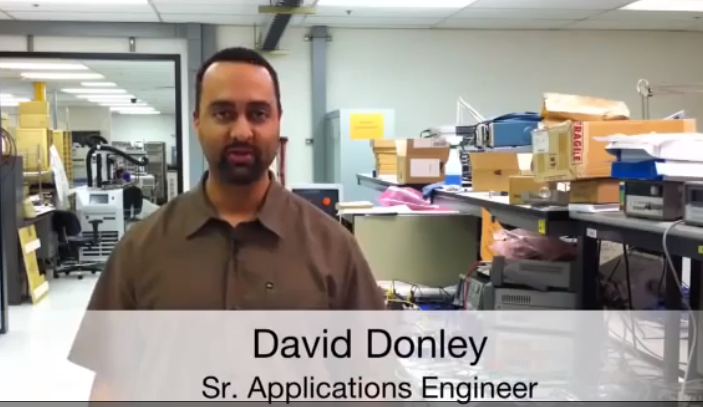 David Donley, NXP® Semiconductors, talks us through a demo of using a low-cost LPC11U14 Cortex-M0 MCU with USB to program the flash on an LPC1227 Cortex-M0 industrial microcontroller. 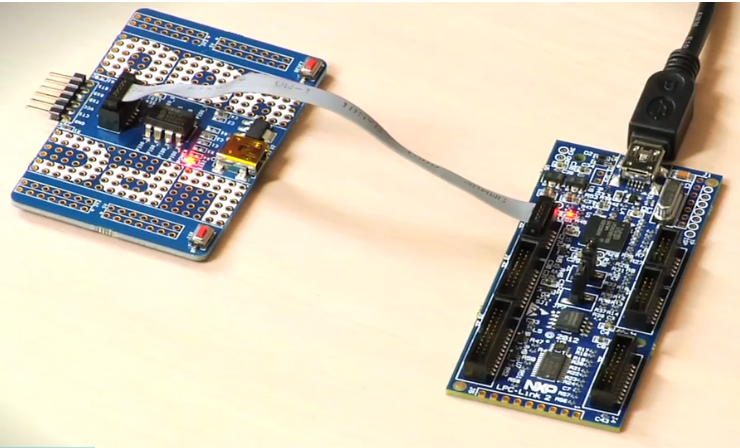 The demo further features NXP's ultra-low cost LPCXpresso development platform. 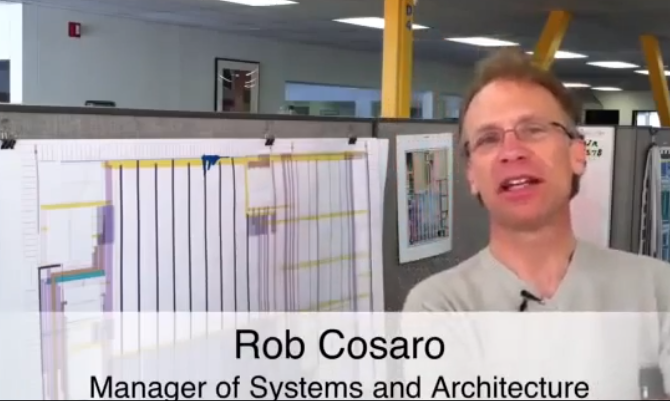 This demo was live from the trade show floor at ESC, Silicon Valley, 2011. 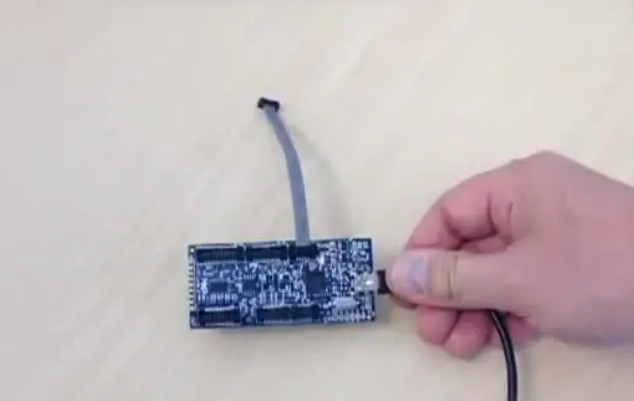 Demonstration of NXP® capacitive proximity switch which consumes only 5uA. 10,0000 new users this year can't be wrong! Learn how to develop real applications on the NXP® LPC microcontrollers using the LPCXpresso development platform for Linux and Windows. This training session covers both the hardware and software elements of LPCXpresso, the IDE, the debugger, the debug probe, and the development board. You will see LPCXpresso in action and take away the necessary knowledge to kick start your LPCXpresso-based development. 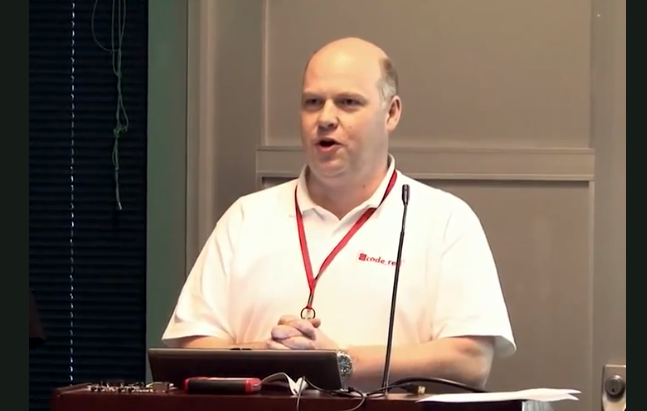 It also introduces some of the more advanced functionality available in the Red Suite and Red Probe+ products, such as the non-robinvasive debugging provided by Red Trace on Cortex-M3 based parts. Preview how LPCXpresso can even debug a multi-core device. 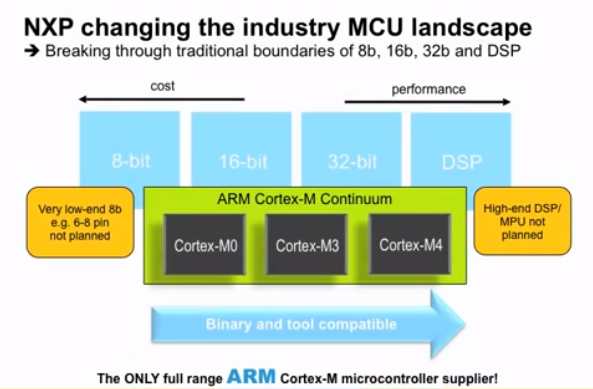 This 59-minute session was presented at ARM TechCon in November, 2010, by Andrew Beeson, Tools Developer, Code Red Technologies, and by David Donley, Senior Field Applications Engineer, NXP Semiconductors. NXP®s MCU portfolio includes the most advanced, highest-performance, and power efficient LCD-based 32-bit microcontrollers available today. 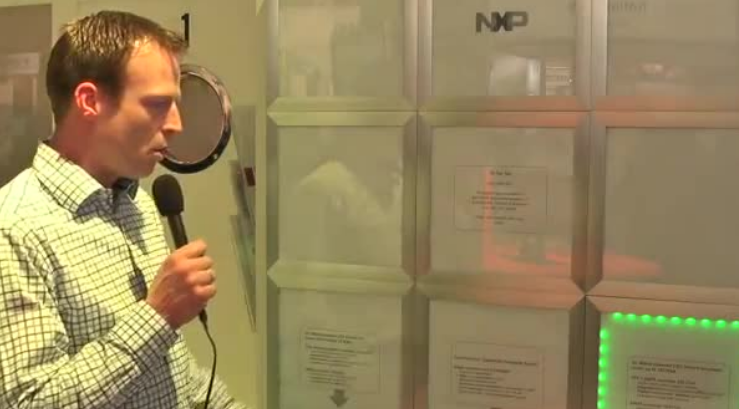 Axel Wolf gives an overview of the advanced LCD capabilities of NXP Semiconductors LPC microcontrollers.